The Hercules DJ Trim 4&6 USB Audio Interface for easy integration to DJing gear, the device’s 4 Line or Phono inputs can be connected to CD or MP3 players (Line input) or turntables (Phono input) and be mixed with music files stored on the computer. The Hercules DJ Trim 4&6 USB Audio Interface features a 4 input / 4 output configuration that can be switched to a 2 input / 6 output configuration, allowing users to export their mix to an external mixing device. the preamplification on inputs is adjustable using two rotary switches allowing fine adjustment of the volume at the inputs, in order to fade high-level sources (e.g. some CD players) or amplify weaker audio sources, such as turntables. The Hercules Deejay Trim 4&6 features 4 audio output channels: Two +4dBu ¼" Jack outputs for PA equipment and four -10dBv RCA outputs for mixing decks and conventional amplifiers. Considering purchasing the Hercules Trim 4 - 6 Pro DJ Audio Interface Hub? Have questions? Ask people who've recently bought one. Do you own the Hercules Trim 4 - 6 Pro DJ Audio Interface Hub? Why not write a review based on your experience with it. 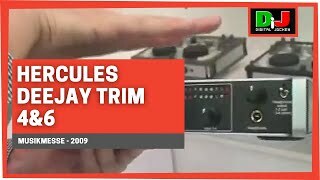 Seen a video for Hercules Trim 4 - 6 Pro DJ Audio Interface Hub online or have you own video? 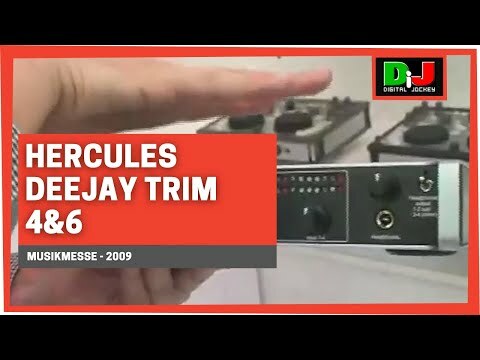 Check out Hercules Trim 4 - 6 Pro DJ Audio Interface Hub on DJkit.com!